Description: Feature-packed theme with a solid design and a friendly interface. Designed by digitalnature. You have done a very good job.. nice template. now using this slightly modified for http://www.istanbulblogger.com it is very clean and easy to adjust to suit . how to remove hover effect text title in blogger?? is there no solution to the menu bar floating problem? like "menu bar" said it displaces, how can we lower it? moreover my header image slides down too and therez black space above (at the top of page) header image. help will be much appreciated. 1) The tabs for 'Tags', 'Popular Posts' and 'Comments' on Page Elements are missing/doesn't show up as said on the attached instruction; thus, I can't edit it. 2) The 'Comments' tab on homepage shows 4 links all pointing to the homepage. Blogger page navigation system is not working in this template.....any solution???????????? This template is awesome! A three-column footer would make it smashing! Hi, How can I change the main layout's width? I want 2 do it 600px. Is it possible? Anyone know how to take out the drop down menus. I want to keep the menus themselves, but I don't need the additional sub-level pages. How do I get rid of them? Anywhere on the code that I can edit it? i have a problem with mystique, i change the logo, but the log dosent apear, apears as a image not found, but i have chek by ftp, i the image exist in the folder. I have problems with comments too.. I use wordpress and the comments link it's not able! How can I fix that? You should find code below and change the width to 600px. To make font bigger, you should find .post-meta class then font-size in it and give a greater value. When i post two posts in a day, first one's date can't be shown. WHat Happened with this theme, every Images delete ? hi, i can't remove the blog title that's superimposed on my custom header logo, in wordpress. how do i remove it? please help. I'm having problems with the files Mystique (Blogger). They were deleted? Or are they just temporarily down? Host seems down that has files like images and js files. So they dont work. Please fix it asap..
Why dont you use blogger to save your images? its been 3 days you're server aint fixed yet? atleast tell us whats the problem bro, anyways atleast tell me how to fix the following blogger problem its very important!! whenever i visit my blog whether the main page or any post, the browsing kind of stucks for a moment i mean half of the screens background (bottom) remains black then after sometime it loads completely to white/gray bg, you can see this problem in your hosted demo of blogspot version. tell me the solution as soon as possible! How do you simply remove the pop up Twitter button? It was was enough on the older versions but it doesn't give you example code now to click on. The date on my post's header isn't showing, is there a way to correct this? yes Twitter button is missing whereas it is in the wordpress version...please fix it bro. I'm almost done with the deployment. Everything looks fine. But jquery functions not working ? why ? I tried changing the jquery.js (innercontent) with working onsite content (your site). Is there any way to test this theme functionality? Yes please... Twitter button is missing and the rest is ok!!! we have a problem.... This template doesn´t work anymore.... when fix it, send me a email please! Where is the older version. I need older version. Though as there is already a twitter widget I don't really think its necessary rite. how to remove twitter icon on the top right navgation menu ? the one next to the rss feed icon at the top right. how can i change the post font size? 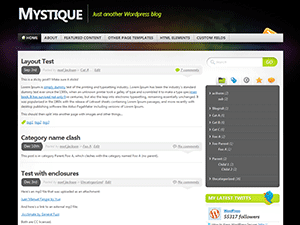 Hi i was planning to convert mystique wordpress to blogger but I found this one. Thanx I no need to convert it now. Hi when I try to activate the plugin right after uploading it, a message says the plugin does not have a valid header. Any hint would be very helpful! Como puedo bajar mas el menu?? download size is zero bytes. Just yesterday, the date of the post stopped showing up. The buttons for the categories, tags, archives, top posts, and recent comments are not showing up either. Did not experience any of these problems until yesterday, and not really sure what the deal is. I have not made any recent changes to the HTML or CSS, to cause any problems. Could you please provide a fix, or an update on what may be going on. Thanks. Also, if you check the Blogger demo on this very page, you will notice that the same issues, I just stated, are occurring there as well. It is very clean and works very well. Thank you for this theme! wuuuuv, very very nice beatiful theme.